So it’s been a while since the last post, so let’s start off with a review! Instead of previous reviews that were limited mostly to games, I was given the option to review a Pilot Hi-Tec C Gel Ink Pen over the past few weeks. As I am still in pharmacy school, there’s quite a bit of writing – though most of our notes are digital now – so it gives me plenty of opportunities to try out this pen. 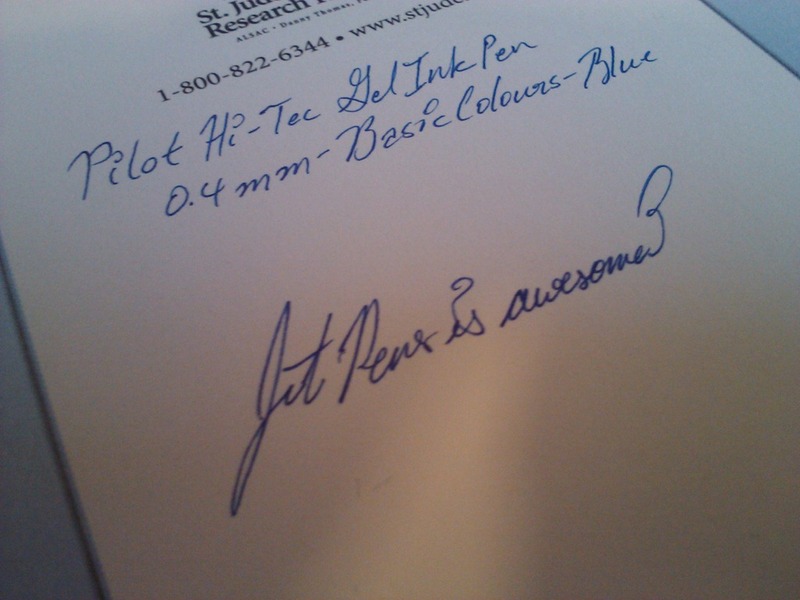 The Pilot Hi-Tec C is really lightweight compared to my typical writing instruments (e.g. Uni-Ball α-gel pencils), giving it a very free feel to it. This increased the amount of time it took before my hand started to feel tired. It did take some getting used to for me, however. The narrow diameter of the pen gave me a little difficulty since I’ve been using wider pens for years. However, it can be taken elsewhere easily due to its size (I keep it with my Kindle now). 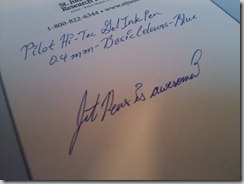 The feel of the pen on the paper is a factor a lot of people take into account before buying into a pen. I don’t use anything over 0.5mm, so this is something that concerns me quite a bit. For some thinner pen nibs, the pen will scratch into the fibers of the paper and eventually collect so much that it becomes a hindrance in keeping a neat line. They usually will start building an inability to roll smoothly and consistently. However, in this particular pen, I am absolutely satisfied. 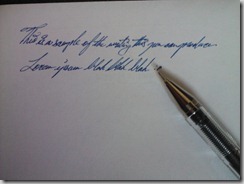 The pen – despite the thin nib – glides easily across the paper with neat lines, allowing for my rather thin script to appear fairly clear, which I’m sure is a relief for my professors and possibly my patients. 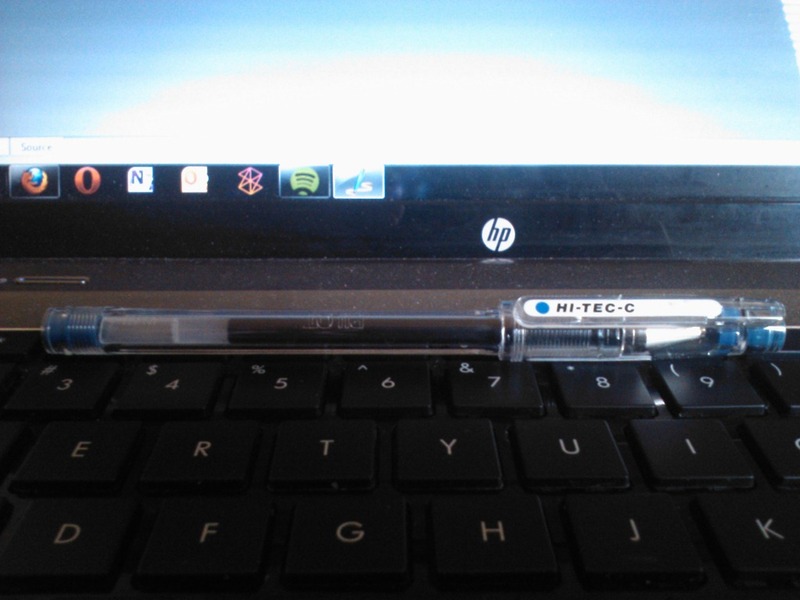 It’s surely a relief for me, as now I can actually read my notes using the Hi-Tec C without having to use print. One thing I should also note is that the ink dries fairly quickly. Having a left-handed artist for a friend, I occasionally see her smudge ink on paper when she’s working with pen unless she contorts herself in an unnatural manner to not smear the ink. I try to keep this in mind when I try out new pens so I can sometimes suggest some for her, and I can say this one would be pretty handy for the lefties out there. I’ll be honest. When I was out and about in Hong Kong and Japan, I saw a lot of this particular model of pen, but never really gave a second thought to it. The cost of the individual pens there were around where I might pay for a pack of BIC pens (which I find uncomfortable to write with and have failed me many times in the past). Over the course of trying out the Hi-Tec C, I’m regretting that I judged it prematurely. This particular pen is US$3.30 on Jet Pens, so it’s not particularly expensive, and if you buy enough over there, it’s free shipping, so I definitely encourage trying it out! 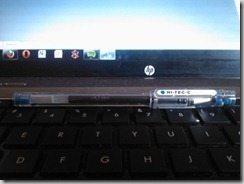 This entry was posted in Reviews and tagged Gel Pen, Hi-Tec, JetPens, Pilot, Review on 2012 April 30 by 旋風.